By now the pre-release weekend should have come and passed. I ended up playing in 4 different tournaments, used a variety of decks, and learned a lot about the EMN/SOI limited format. Some strategies worked better than others, and I think if I had a few more days to look over the spoilers I would have done better, but overall I’m a fan of the limited experience. The the various archetype synergies are pretty deep, and there are quite a few different ways to play. I’ll be going into my decks and card choices a little bit later, so before that I’d like to talk about the remainder of the cards from the set. If you want to look at my picks for lands and artifacts from Shadows Over Innistrad please click on this link. Otherwise, jump ahead to my first choice for colorless cards. 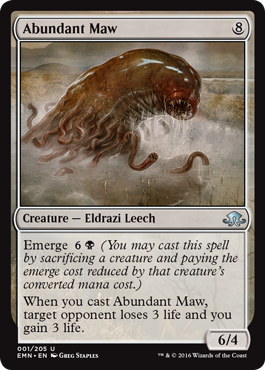 Some of you might wondering how good the eldrazi creatures with emerge are, and in my opinion they are pretty darn good. They do a great job of “processing” fodder from turns 2 or 3 and let you play a big beater for cheap. Take Mockery of Nature for example. In a green based deck you can usually cast this on turn 5 by sacrificing a 3 mana creature from a previous turn. 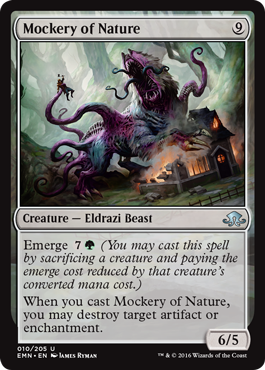 What makes Mockery of Nature one of the better Eldrazi horrors is it’s ETB effect. The amount of playable enchantments in this format is very high which means there is a high chance you’ll be able to destroy something when he comes into play. Otherwise he’s a big creature that comes into play easily through emerge. Even if you’re not in green I’d recommend this as one of your beaters. If you can splash a little green, great. Otherwise it’s still playable. Top 3rd or 4th pick from a pack in booster draft. 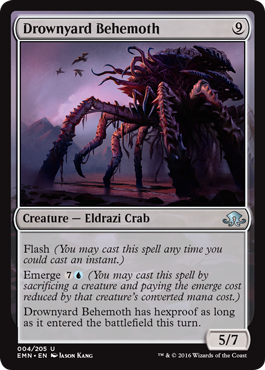 Combat Trick Crab, or Drownyard Behemoth, is another Eldrazi monster that I wouldn’t mind playing with. It’s incredibly hard to kill, and you can flash it in and guarantee that it blocks and kills whatever you want it to. That’s why he only has hexproof on the turn he enters I believe. The Emerge ability is blue though, which means he’d probably be best in a UB madness/zombie, UW spirit/Flyer, or a UR Madness/tempo deck. Let your opponent waste on of their removal spells on your 3-4 mana spell and then sacrifice it at instant speed to put the Behemoth into play. Great for tempo decks. Not as high of a pick as Mockery, but still a great card to have in limited. 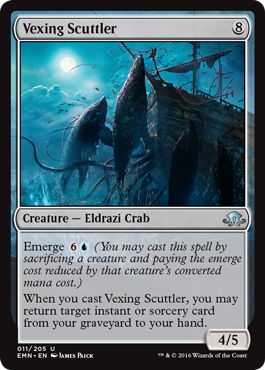 To get the best value out of Vexing Scuttler you should be using him in a deck with lots of instant and sorcery speed removal. This is probably going to be black, red, or white. Being able to play a 4/5 creature for 4 to 3 mana that gets you back a card like Murder is pretty impressive. If you’re drafting a lot of good instant/sorcery removal, I would recommend picking him up early to get more value out of those spells. Even if you don’t have that many spells to recover, as long as you have a way to produce blue mana I think he’s worth using. Abundant Maw is a perfect fit for GB/BW Delirium decks as it puts a creature into the graveyard and also drains your opponent for 3 life. I also really like it in UB zombies with the cards Advanced Sticthwing or Stitchwing Skaab that let you play him for almost nothing then use their abilities to put them right back into play. His 4 toughness isn’t great, but that 6 power is. Most of the time you should have no problem casting it for 4 or 5 mana, and a 6/4 for that cost that drains 3 definitely meets the criteria for a playable card. Must play for a black deck, but also not bad if you’re in need of a finisher in another color. Lashweed Lurker has one of the stronger casting effects of the uncommon Eldrazi cards, but it’s also a little bit trickier to play. If you have ways to create any color mana like with Cryptolith Fragment you can really take advantage of his ability in a green or blue deck, but I found myself usually casting the Lurker for 8 mana and not really caring. It time walks your opponent if used offensively, and even lets you bounce one of your own creatures to save it from some kind of enchantment. 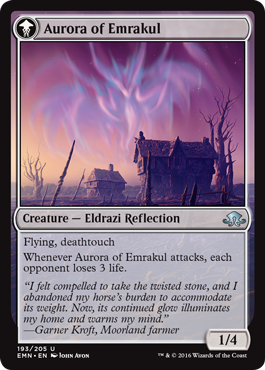 By bouncing another one of your Eldrazi, you can draw it on your next turn and get even more value from its casting effect. I’m a little conflicted about what to rank it, but I think it’s body and ability make it a 3 (although I’m leaning towards a 2.5 in some cases). Not one of the best Eldrazi, but in a UW or UB flyers deck it’s a strong card. Its emerge cost is only 6 so you can easily play this on turn 4 by getting rid of a 2 mana creature. A 3/4 flyer that draws you a card for “4 mana” is amazing for a common card. If you’re looking for a finisher, this is not it, but if you’re looking for something to add even more synergy to your flying deck put Wretched Gryff in. Just like the Gryff, It of the Horrid Name (I mean Swarm) shouldn’t be thought or or played as a 8 mana creature. Outside of a green deck I really wouldn’t recommend playing this, but if you’re in green it’s decent. Most likely you can cast this for 4 or 5 mana, trading a 2/2 or 2/3 creature for a 4/4 and two more creatures on the side. What would have made this better was if it had something like Deathtouch. I mean, it is a centipede after all. 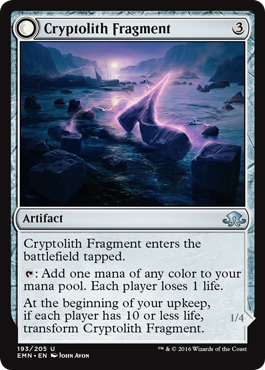 I like that Cryptolith Fragment is a colorless mana fixer that any deck can play, and I really like that you can flip it into a creature that has both flying AND deathtouch, but I think it’s not for every deck. If you’re playing a defensive game or have some ways to gain life or keep yourself from dying to an opponent’s attack then you should go ahead and play it. It’s a must play for any deck wanting to splash a 3rd color, and I think it would be great in an aggressive deck as a way to push your opponent to the brink as soon as possible. Just be careful of your own life total and use it sparingly so you don’t put yourself into a difficult situation later in the game. Great color fixer, helps Delirium, replaces itself when you sacrifice it. 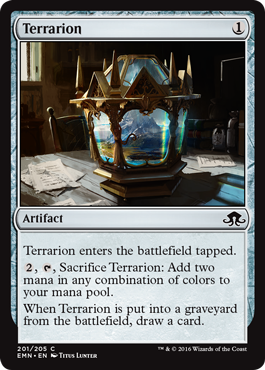 Great card alongside Fragment when you want to go into a third color for some powerful cards or just to use those emerge effects of Eldrazi that aren’t in your colors. Field Creeper – Backbone of Delirium decks as when it dies you get both a creature and artifact typing in your graveyard. 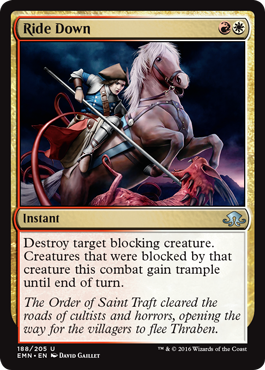 Gets you half way to activating the effect, and also good fodder for Eldrazi. Geist-Fueled Scarecrow – I’m not sure how good this card can be. I think this is a card you’d want to play in an aggressive deck that has a lot of 2 and 3 drops that top out at 4, but if you’re playing a more midrangey deck with a higher concentration of 4 and 5 drops, it might not be as good. There aren’t too many multicolor cards to talk about, but the ones we have are rather neat though. 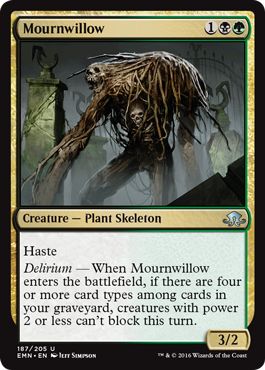 Mournwillow is reminiscent of Dreg Mangler from Return to Ravnica. They both cost 3, both have haste, but I like Mournwillow a lot more because of its enter the battlefield effect. There are a large number of 2 power creatures (especially 2/3’s) in this format, and Mournwillow lets you side step them completely. If your opponent is ragging on you with an army of 2 toughness spirits, Mournwillow gives you a chance to race them and set up your board for a lethal strike. Must play for GB delirium, especially if you can make you 6/6 boar unblockable. Take away your opponent’s chumps and you can win the game out of nowhere. I was a big fan of Hellrider during Dark Ascension as it let you build up a huge team and then swing for tons of damage all at once. Being an enchantment, this is a lot harder for opponent’s to get rid of. Campaign of Vengeance would be great in a deck with a lot of flyers or one that could make a lot of tokens. Building an aggressive BW humans deck with this at the top end could be crushing to an opponent, but I think it would also be possible to build a high toughness “wall” deck to block opponent’s creatures all day and then slowly drain them with a few flying creatures or a big creature that won’t die easily like Inquisitor’s Ox. There are some creative things you can do with this card, so keep it in the equation unless your deck doesn’t sync with it. Red and White don’t seem like they would be good together in this format. Red has wolves, vampires, and madness while white has spirits, humans, and some delirium. Sure there are some instances where a RW deck might be okay, but most of the time I think you won’t find a spot for Ride Down. Good card, but probably something you’ll splash so it won’t see too much player. Before I end this series for Eldritch Moon, I’d like to leave you with some decks that I build during the pre-release as well as what I thought about the cards, archetypes, and interactions. My first deck was a GW human deck during the midnight pre-release at Prinny Club in Nagoya. There were 68 players at this tournament, one of the biggest pre-releases I’ve ever been to. There were only 3 rounds though, so I didn’t get a chance to take my deck the distance. I was really pleased with the results though. I went 2-1 with this deck, beating UW in round 1, RW in round 2, and then lost to another GW deck in the 3rd round. The curve of this deck was sick. I had tons of aggressive 2 drops and some decent 3 drops. Always Watching was a bomb in this sort of deck as it let you play lots of creatures then attack relentlessly until my opponent gave up. The removal was a little light, but the card advantage and pressure was there. It was highly dependent on draws though, so when my 3rd round opponent produced multiple removal spells in the form of the Choking Restraints and Faith Unbroken I didn’t stand a chance. I was actually able to cast Emrakul twice in this tournament thanks to cards like Geier Reach Sanitarium (constructed playable card) and Blessed Alliance was an amazing card. Helped me to flip Lone Rider, kill attackers, and untap my own creatures for near combat tricks multiple times. I went with GW again on Saturday afternoon, and it worked really well once more. I had much better removal again this time around, including some combat tricks like Woodcutter’s Grit. Most of my cards cost about 3 mana which made the deck a little slower, but the tempo of the deck was great thanks to Thalia. I was able to activate delirium easily thanks to Noose Constrictor, and Ironclad Slayer was much better than I thought it would be. There were so many good white enchantments that I found myself getting to use them twice on many occasions, especially Choking Restrataints. I beat RW in round 1 thanks to Thalia, lost to BW round 2 because of Always Watching and amazing removal like Murder, but beat UW in round 3 easily when my opponents couldn’t stop Shrill Howler. In round 4 I lost again, this time to a BUW deck because of awful mana flood and mulligans, but I won my last 2 rounds against GWU and GW thanks to some smart plays on my part to win by attrition. I ended up in 9th place. I felt rushed and didn’t know what to play on Sunday at Big Magic. I thought I had a really good pool but couldn’t decide what I wanted to play. I won my first match with a GW build of this pool, lost round 2 with BW, and then lost my last 2 with GB Delirium which I thought was the best build. I made quite a few mistakes during this tournament such as being too aggressive when low on line and dying to burn or running into a combat trick (especially with Emrakul in my hand about to played the next turn). I beat RW round one, but lost to GR, BR, and Naya in my next 3 matches. The removal was really good in BW but didn’t have strong creatures while GW lacked ways to straight out kill a creature like black could. I learned some important things though. 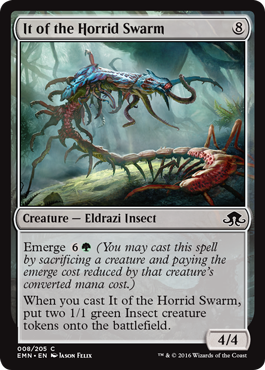 First off, Bloodbriar was REALLY good with Emerge. I thought it would be so so, but between sacrificing enchantments, lands, and creatures, I was able to pump him up rather consistently. If you have a lot of clues he can get HUGE. I also believe that the artifact creatures are absolutely necessary in delrium decks. 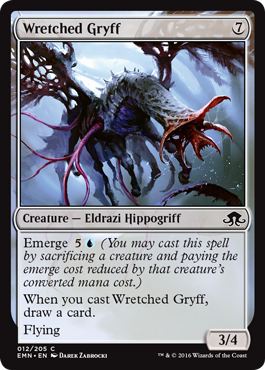 Cards like Field Creeper were integral in getting Eldrazi out early and activating Delirium. I was definitely feeling some fatigue by the second tournament in the afternoon. I had a really beefy pool, but it was a little top heavy and there were a few card choices that I shouldn’t have used in the deck. I had a few more random 2 and 3 drops I could have played, but decided against it to keep the deck’s power level high which ended up being my downfall. I simply couldn’t stop quick decks well and ended up taking too much damage early on before I was able to take over the game later. I lost round 1 to Naya due to playing Cryptolith Fragment and killing myself (which I then dropped), but won against a Grixis deck in round 2 thanks to my powerful 5 drops. I lost against BW in round 3 because my opponent had way too many flyers for me to deal with and better removal. In round 4 I lost to GW by keeping some bad hands and also making too many mistakes in general. Low mana curves are good – you need to have more cards at the 2 and 3 drop spot than at 4 and higher. 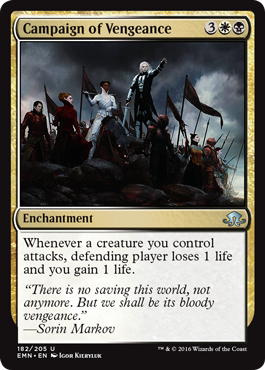 This is important for setting up a good defense against opponents, but also to help play those Eldrazi creatures with Emerge. If you’re playing sealed, look for combinations that give you the most 2 and/or 3 drops. Removal comes in different forms – Aside from instant and sorcery removal spells in black, white, and red, there are a number of enchantments that get the job done rather well. Sinister Concoction is a good example. Don’t shy away from combat tricks – the escalate spells at instant speed like Blessed Alliance were really good, and I even found myself playing 1-2 instant speed pump effects like Woodcutter’s Grit to win some key battles against opponents. Tempo and pumps are one of the key themes in this format. 3 Colors isn’t impossible, but tricky – I didn’t try more than a splash, but I’d be careful about building 3 color decks unless you have good mana fixing. That’s going to do it for this set’s Playing To Your Weaknesses articles, but I’d like to hear about how your pre-releases went and what worked/didn’t work for you. I hope that my evaluations helped you out somewhat, and that they can continue helping you in the future as you draft at your local store, do limited PPTQs, or attend other large events over the next few months with EMN/SOI products. I’ll be playing a lot of limited during this season in preparation for GP Kyoto in September, so until then feel free to post your thoughts on EMN limited. If there were some cards I talked about that you think should be re-evaluated, I’d like to get your input on them down below. Coming up later this week, I’ll be taking one last look at the standard metagame from Shadows Over Innistrad season, as well as how I think Eldritch Moon cards will affect it. After the weekend, I’ll be looking into cards to invest in for new standard and talk about how my choices from last time did. Hope to see you back here then. Thanks for reading!